I read this book with a sense of awful warning, wanting it not to be true but knowing that it was. Pragmatic to the point of being painfully honest. Not to be missed. The human face and the all too human agony of law enforcement. Oh, to be living in Mr. Arion's paradise of subsidies and free-loading! We would love to recommend that the reader take on board the advice given in this book - but we daren't! A graphic account of why some small businesses get smaller and smaller and smaller. 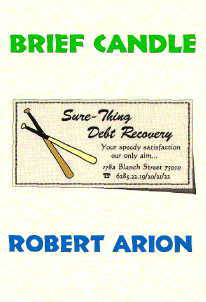 Blurb: BRIEF CANDLE is a claustrophobic novel about a man whose life is being infiltrated by strangers with motives that he cannot fathom. As everything in his life seems to be taking on dark overtones of uncertainty and peril, Georges Trevolin, a man whose life does not bear close official scrutiny, realizes that he may be standing in an invisible spotlight, like a soldier on a moonless night caught in an infra-red spotlight. Trevolin has a great prize in his sights but he cannot know for certain how close he is to losing it. While forward progress remains uncertain, the likely sources of trouble are many and the ranks of his enemies seem to become more tightly packed with every passing day.